We had a final push to finish jobs in the Llanidloes garden yesterday before our open event in the afternoon. 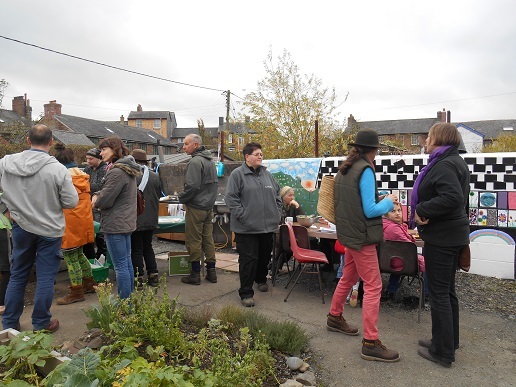 The weather stayed dry if a little windy, but we had around 70 people call in through the day to look at the transformed community space. 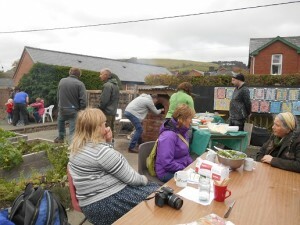 We enjoyed pizza cooked in the cob oven, by our Newtown volunteer chefs, Chris and Alistair. We ate salad harvested from the garden. On display was the photo diary of how the garden has progressed over the last year. Transformed into diverse habitats for wildlife, whilst providing food and sanctuary for all of us. 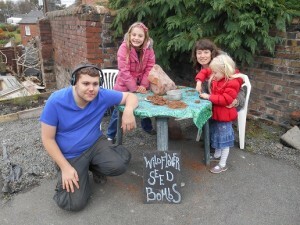 We made wild flower seed bombs for people to take home and spread around the place. In the morning Dave, David and Brian put up the flag pole, we forgot to bring a flag so David quickly made one from scrap material. The flag pole was a request from the scout groups, so that when they are using the garden they can fly the Union jack. Most the time we will be displaying our Green flag award. If anyone is feeling artistic and wants to make us a community garden flag, please do. Brian and I finished the entrance sign off, attaching the waterproof clip frames, that will allow anyone to put up fliers and notices in the dry. 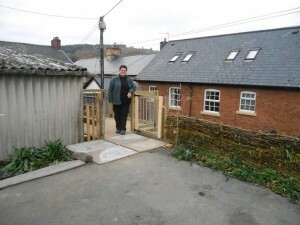 Rhys and I laid the paving in front of the viewing platform to give a smooth level surface to access this area. Whilst keeping an eye on the fire in the cob oven that needed to be lit three hours before we started cooking. Beryl arrived early for the open event and stepped straight in to help us out, planting the last of the plants in the bed for dye plants. The garden is open at all times for anyone to visit, volunteer sessions are on Monday mornings. You can find the site behind Bethel Street Chapel in the centre of town. Next week in the garden I will be teaching a two hour practical session on over wintering crops. 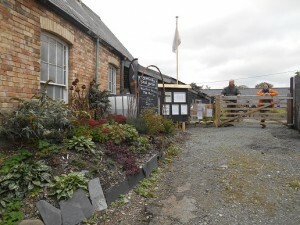 Come an get stuck in, we will be planting and sowing a variety of crops that will give you a crop from May next year. Peas, beans, onions, garlic, salads, herbs. No experience needed, and it’s FREE. 10 – 12am. Booking is essential for this course, through the botanic garden of Wales. This entry was posted in Biodiversity, Community Gardening, Courses & training, Events, Llanidloes, Uncategorized, Volunteering by Emma Maxwell. Bookmark the permalink.